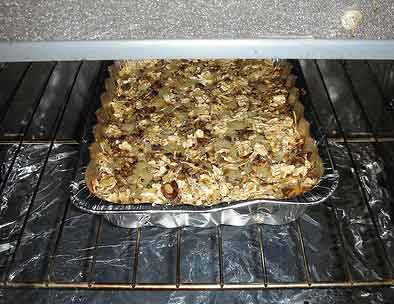 Here are two nice kosher kugel recipes. Soak one-half ounce of yeast or one cake compressed yeast in a very little lukewarm milk. Add a pinch of salt and one tablespoon of sugar, stir it up smooth and set back of the stove to rise. In the meantime rub a scant cup of butter and a scant cup of powdered sugar to a cream, add gradually the yolks of four eggs, one at a time and add also the grated peel of a lemon. Sift two cups of flour into a bowl, make a depression in the centre, pour in, the yeast, one cup of lukewarm milk, and make a light batter of this. Add the creamed butter and eggs and stir until it forms blisters and leaves the bowl clean. Take one-half cup of cleaned and seeded dark raisins and cut up some citron very fine. Dredge flour over them before adding, and if necessary, add more flour to the dough, which should be of the consistency of cup cake batter. Last add the stiffly beaten whites of the eggs. Place in a well-greased long or round pan with tube in centre. Let rise until double in bulk, and bake in moderate oven until browned and thoroughly done. kugeltopf well with fat, and pour about a quarter pound of hot fat over the kugel. Bake immediately; serve with wine sauce. Cook one half tablespoon of flour in one tablespoon chicken fat, add one half cup of soup stock gradually, and one-half teaspoon each of onion juice, lemon juice, salt, and one-quarter teaspoon of pepper, one and one-half cups of veal or chicken, chopped very fine, one pair of brains which have been boiled, mix these well, remove from the fire and add one well-beaten egg. Turn this mixture out on a flat dish and place in ice-box to cool. Then roll into small cones, dip in beaten egg, roll again in powdered bread or cracker crumbs and drop them into boiling fat, fry until a delicate brown. 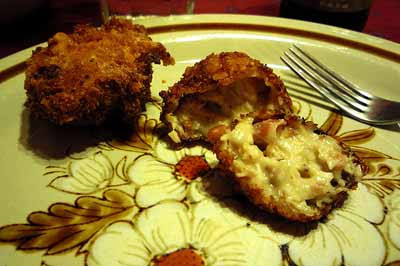 You just made Jewish chicken croquettes with a little help of this recipe. For Jewish chicken recipe croquettes, chop the chicken very fine, using the white meat alone, or the dark chicken meat alone, or both together. Season with salt, pepper, onion-juice, and lemon-juice. Chopped mushrooms, sweetbreads, calf's brains, tongue, or truffles are used with chicken, and a combination of two or more of them much improves the quality of the croquettes. And that's the recipe.